Brushed stainless steel case and bracelet with PVD gunmetal. Super-LumiNova™ three-hand analog display with Argonite high-accuracy quartz movement, two sub-dials, and date display window. Navy blue dial face with Arabic numerals, minute track at perimeter, and brand name. Brushed stainless steel top ring with PVD gunmetal. 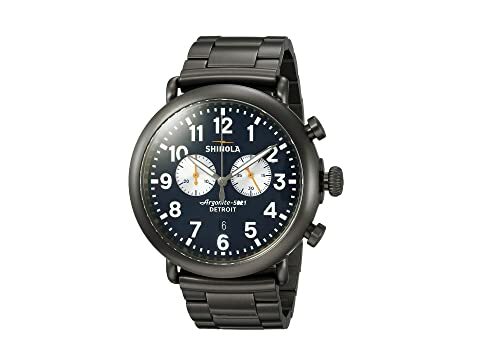 We can't currently find any similar items for the The Runwell 47mm - 20062178 by Shinola Detroit. Sorry!